Earth Defense Force shoot 'em up gets surprise western release. D3 Publisher has released Earth Defense Force 4.1: Wing Diver The Shooter for PC via Steam and Humble Bundle (Steam key) worldwide. The top-down shoot ’em up spin-off of Earth Defense Force 4.1: The Shadow of New Despair first launched for PlayStation 4 via the PlayStation Store in Japan in November 2017. While the game’s official Japanese website lists both the PlayStation 4 and PC versions, the official English website only lists the PC version, suggesting the PlayStation 4 version will not be released in the west. 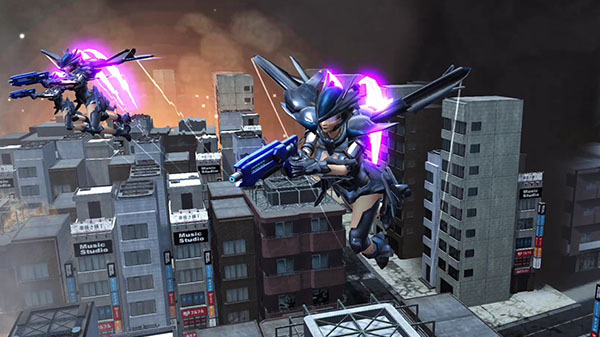 Spawned from the war for existence itself between the Ravagers and the Earth Defense Force (EDF) featured in Earth Defense Force 4.1: The Shadow of New Despair comes a brand new 3D, top-down shoot ’em up spin-off! Players will step into the shoes of a soldier in Pale Team, an elite branch of the EDF’s Wing Diver division, and once again fight in the world featured in Earth Defense Force 4.1: The Shadow of New Despair. This game features 60 different weapons to collect and master throughout the game’s 6 missions and 5 difficulty levels (Easy, Normal, Hard, Hardest, and Inferno)! There’s even a leaderboard for high-scores! It’s been several months since the most recent invasion of the Ravagers, alien beings from another planet. The EDF have been developing a new aviation unit for their Wing Diver soldiers. Their research has focused on making the units suitable for long-term flight, and ground-breaking advances have been made so soldiers can emergency reload without going back to the ground. The unit’s testing, being undertaken by the elite Pale Team, was entering its final stages when the incident happened. That very same day the EDF was amassing its forces in preparation to launch an attack on the enemy mothership. But that’s when a large enemy force appeared, as if they’d been lying in wait from the very beginning! The EDF could only send what few forces they had remaining to eliminate these giant monstrosities. When the stage stops scrolling, its time for Shoot Up Time! A huge influx of enemies will appear on the screen, forcing you to rely on instincts alone to kill them all! The more you kill, the higher your COMBO gets, and the bigger your score will become! These in-game missions are fully voiced with a whole host of characters that will interact with and support you. From the Ranger Units fighting on the ground to your other Pale Team members providing back-up, and even civilians trying to escape!